Radio-quiet coronal mass ejections (CMEs) are those with no detectable type II radio emission in the metric and decameter-hectometric (DH) wavelengths. (The CMEs may be associated with other types of radio emission such as type III bursts, see definitions for the different types of bursts or the diagram of burst classification). The radio-loud CMEs are those with identifiable type II burst in the DH domain from Wind/WAVES data, irrespective of the presence of a type II burst in the metric domain. Fast and wide CMEs are those with speeds exceeding 900 km/s and widths exceeding 60 degrees. Normally, such fast and wide CMEs should be able to drive shocks in the corona and interplanetary medium, which accelerate electrons and produce type II radio emission. Why are they radio quiet? During 1996-2005, the CME catalog lists 472 fast and wide CMEs detected by SOHO/LASCO, out of which 156 were radio quiet (~33%). Over the same period, there were 275 radio loud CMEs. Some radio loud CMEs were slower than 900 km/s, so the numbers don’t match. 33% is a significant fraction. To see what distinguishes radio quiet from radio loud CMEs, we investigated their speed, width, solar source location, and flare size. Longitude (left) and latitude (right) distributions of radio-quiet (top) and radio-loud (bottom) CMEs. Behind-the-limb (“BLimb” ) events are included in the <-90 and > 90 bins as determined from EUV signatures above the limb. Completely backside CMEs are not included in the distributions because their solar sources are unknown. Note the remarkable differences (center-to-limb variation, number of backside events) between the radio-quiet and radio-loud CMEs. 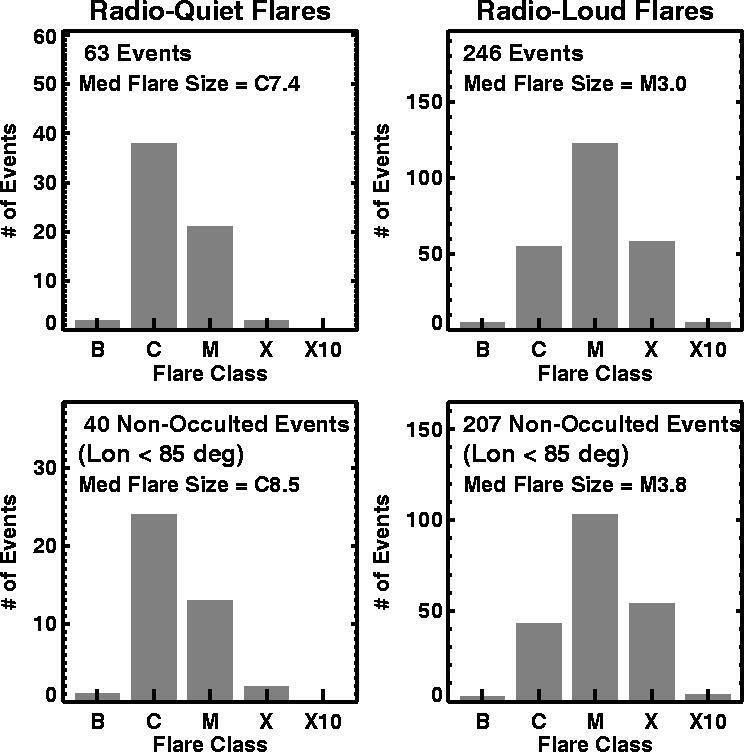 Size distribution of flares associated with radio-quiet and radio-loud CMEs: all flares for which position information is available (top) and flares occurring within 85 degrees from the central meridian (bottom). The median flare size for radio-quiet CMEs is slightly smaller than that of the radio-loud CMEs. Heliographic locations of radio-quiet (left) and radio-loud (middle) CMEs and their comparison (right). The radio-loud CMEs generally originate from center-west parts of the disk while the radio quiet CMEs preferentially originate from limb regions. The east-west asymmetry of the radio-loud CMEs is quite evident (more western events). There are more eastern radio-quiet events, but the difference is not as prominent. Speed (left) and width (right) distributions of four populations of CMEs detected from 1996 to the end of 2005, from top to bottom: all CMEs, fast and wide (FW) CMEs, radio-quiet FW CMEs, and all radio-loud CMEs. The number of CMEs in each population is indicated on the plots. 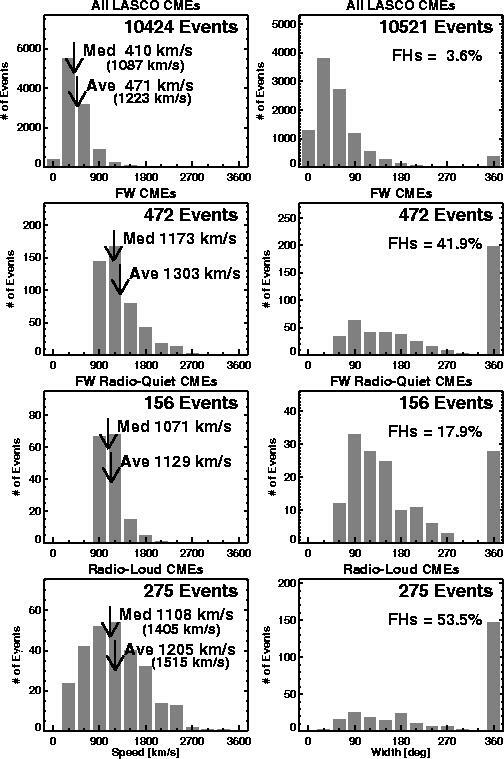 For the radio-loud CMEs, the average (1515 km/s) and median (1405 km/s) speeds are computed for all events and FW events separately. The fractions of full halos (FHs) in different populations are shown for all the distributions. 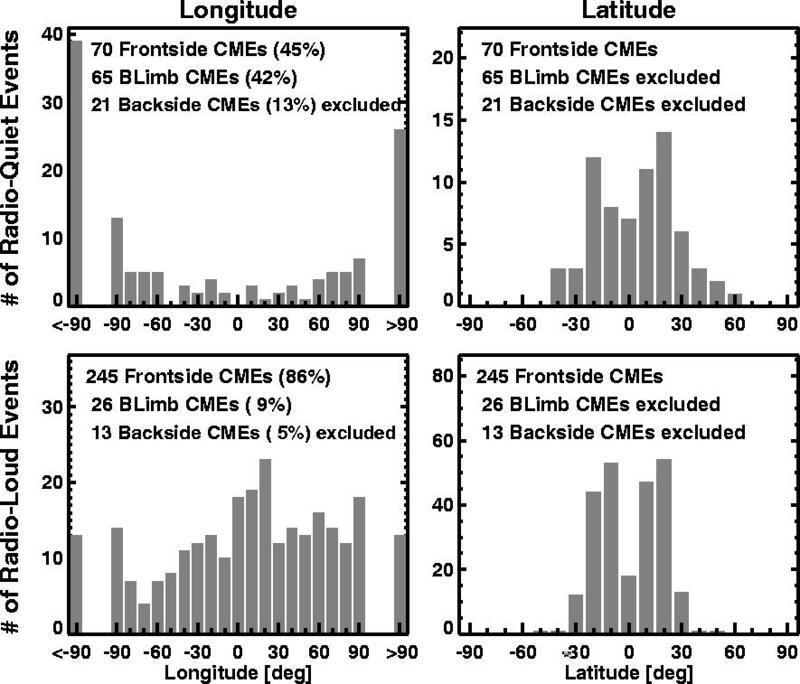 The longitude distributions of radio-quiet and radio-loud CME sources have opposite center-to-limb variation: There are more limb CMEs in the radio-quiet population, while there are more disk CMEs in the radio-loud population. Geometry seems to be an important factor deciding the radio-quietness of CMEs: radio-quiet CMEs are ejected at large angles to the Sun-Earth line (90 degrees or higher) as is evident from the center-to-limb variation and more than 50% back-sided CMEs in the radio-quiet population. This means only a small section of the shock surface is visible to the observer. The lower fraction of full halos in the radio-quiet population also implies that the radio-quiet CMEs are relatively narrow, again implying a smaller shock surface. The disk radio-quiet CMEs must be ejected into a tenuous corona where the Alfven speed must be greater than 1000 km/s. Some radio-quiet CMEs have shocks at 1 AU. These CMEs may be driving shocks only at large distances from the Sun, too weak to be able to produce radio emission.